Purchase this product now and earn 9,119 Reward Points! ACAT/ BHMT is a compounded mutation specific formula, which aids in the body’s ability to support healthy methylation cycle function. The body’s natural production of BHMT enzyme is central to the “short cut” through the methylation cycle, aiding in the ability to convert homocysteine to methionine. The activity of this gene’s production can be affected by stress and by cortisol levels and may play a role in ADD/ADHD by affecting norepinephrine levels. The ACAT gene and the enzyme produced plays a role in cholesterol and other lipid balance in the body, helping to prevent the accumulation of excess cholesterol in certain parts of the cells in the body. 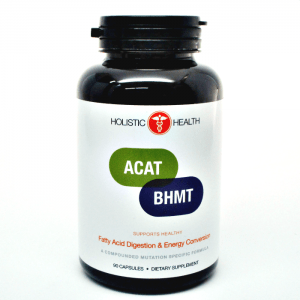 ACAT is also involved in energy generation in the body. It is involved in helping to allow protein, fats and carbohydrates from food to be converted into energy. Lack of the body’s production of ACAT enzyme may also cause a depletion of B12, which is needed for the “long route” around the methylation cycle. OTHER INGREDIENTS Vegetable Capsule (Hypromellose, water). RECOMMENDED USE Suggested Use: As a dietary supplement, take one capsule one to three times a day or as directed by a healthcare professional.